PVC accent strips fit into slatwall groove as a decorative accent. The strips come in 125” rolls enough to cover one 3” on-center slatwall panel. 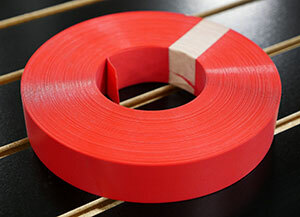 125 foot roll of red PVC accent strips 59 rolls available $4.95 each. Wind Mill round and square laminated HPL table tops create elegance for restaurants, meeting rooms, cafes and other commercial environments. Available in two colors, Wrought Iron HPL and Gloss White HPL. The high quality 1” particle board core material is finished with edging for a versatile and durable finish. Featuring a laminated top finish and brown backer, the table top is designed for durability. Made with exceptional craftsmanship, these tops perfectly complement any aesthetic. 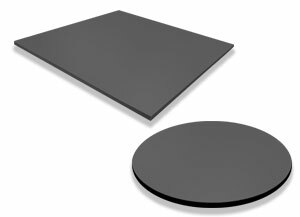 Table Tops are made in the U.S.A. Weight: 48” Square: 65 lbs. 30” Round: 21 lbs. 36” Round: 30 lbs.